President Obama is expected to send his proposed federal budget this week to Congress, where much of the focus will be on strategies for dealing with the deficit. While this next phase of the budget battles comes at a time when Obama’s overall job approval rating has fallen, our March survey found that Obama continues to engender more confidence on the federal budget deficit than either GOP leaders in Congress or Democratic congressional leaders. A majority (53%) says they have a “great deal” or a “fair amount” of confidence in Obama when it comes to dealing with the federal budget deficit. By contrast, 39% have at least a “fair amount” of confidence in congressional Republican leaders on the deficit and just 8% have a great deal of confidence — a 14 percentage point difference. Democratic congressional leaders fare only slightly better: 45% have at least a fair amount of confidence in Democratic leaders; 11% have a great deal of confidence. These views have changed little since September 2011, shortly after the contentious negotiations over raising the nation’s debt ceiling. 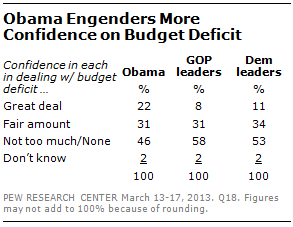 At that time, 52% had a great deal or a fair amount of confidence in Obama on the deficit, 35% expressed that degree of confidence in GOP leaders and 43% had confidence in Democratic leaders. Democrats express more confidence in Obama and Democratic leaders to deal with the budget deficit than Republicans express in GOP leaders. Fully 86% of Democrats have at least a fair amount of confidence in Obama, while 77% have that level of confidence in Democratic leaders. By contrast, 63% of Republicans have a great deal or a fair amount of confidence in GOP leaders to deal with the deficit.